One of the most alluring of the hilltowns of the southern Marche, Fermo has an ensemble of architectural sights which make it well worth a visit. The fortress which once topped the town was destroyed in 1445 in a popular rebellion against the ruling Sforza family and is now the site of municipal gardens which afford fine views over the marchigiano countryside (and a spacious car park). 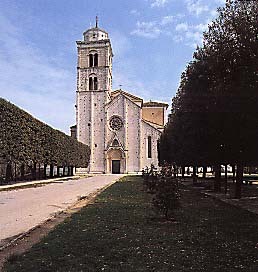 The nearby 13thC Romanesque-Gothic cathedral (below), with its richly decorated interior and fine rose window, now stands in splendid isolation. For British visitors, perhaps the most interesting of the cathedral's treasures is an Arab-Spanish embroidered cope said to have belonged to St Thomas a' Becket, Archbishop of Canterbury (1118-1170), which is on display in the adjacent Museo Diocesano. The main town stands on the level just below the cathedral. Built around the magnificent large square, the Piazza del Popolo (top), are the main municipal buildings. Sansovino's grand statue (1590) of the Bishop of Fermo who was to become Pope Sixtus V tops the main entrance of the Palazzo Comunale which contains the town's art collection, in which the most notable work is an early Rubens painting of the Nativity (1608). During the summer period the piazza plays host to Fermo's music festival featuring some of the world's finest performers, as well as outdoor markets. Also worthy of note are the underground piscine romane (roman pools) which comprise thirty magnificently preserved underground chambers built between 41 & 60 BC to conserve and purify the town's water supply, and regarded as the finest example of their kind in Italy.